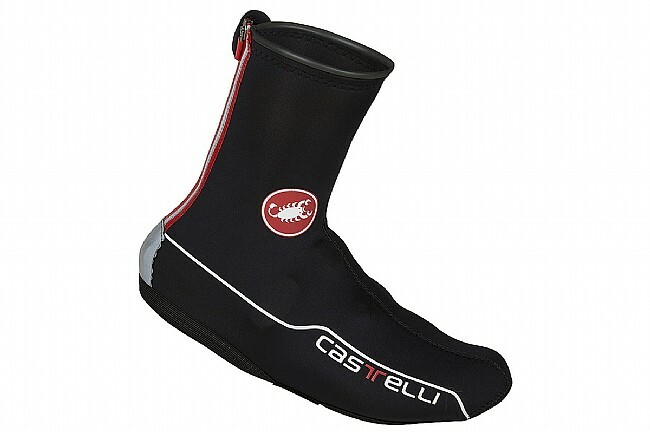 Castelli thinks one pair of booties ought to be enough, so they designed their Diluvio 2 All-Road Shoecover to not only provide durable protection from the rain but also to fit both your road and mtb shoes for a more simplified wardrobe. 3 mm thick, fully seam-sealed neoprene shrouds your foot in cozy waterproofness, and the top of the 16 cm cuff has been finished with an O-ring design that helps prevent water from seeping in. The bottom features a high-durability panel for those moments you spend unclipped, and the velcro cross strap makes it compatible with virtually any cycling shoe. Zipper and Velcro rear closure. Features reflective accents for increased visibility in low light. Small / Medium: 36 - 40. Large / X-Large: 40 - 44. Warm toes are nice! Easy on and easy off! Great product for cold days!